Later topic: Looking for a new project press. small 18th century hand press in south africa? i’m doing research about a Dutch missionary who was sent to South Africa in 1798 by the London Missionary society. This person, Johannes van der Kemp, lived with the Xhosas for more than a year in 1799 to 1801. It is mentioned in a few sources that he had a “small hand press” with him, while living with the Xhosas in the Eastern Cape. I was wondering if anyone could guess what kind of press this was, as he had to transport in on an oxwagon for more than 700 km. please help. This is an interesting quest. One has to assume since he was from the Netherlands, it was a European press. Because of the early date, it would most likely be a hand press also. At that early date it would more than likely be a wooden press.. Even a small table top would be heavy. I hope some of the scholars from various museums and collections will add comments. 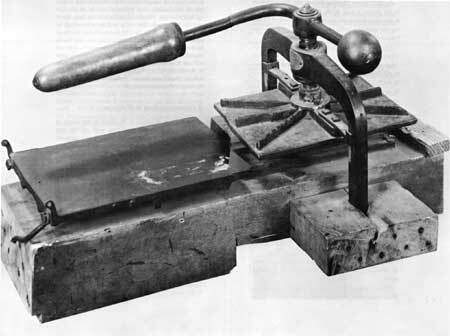 Since cast iron presses were in their developmental infancy one would have to assume that it was a wooden common press. Transporting the press and the equipment necessary to make it operate, type, type cabinet, imposing surface, and other smaller equipment would indeed take an oxcart. The sacrifices and deprivations that that were borne by early missionaries in order to bring the gospel to the ‘heathens’ is an amazing part of the history of printing. Because the first iron hand press, the Stanhope, was invented about that time, it is highly unlikely that he had an iron hand press. 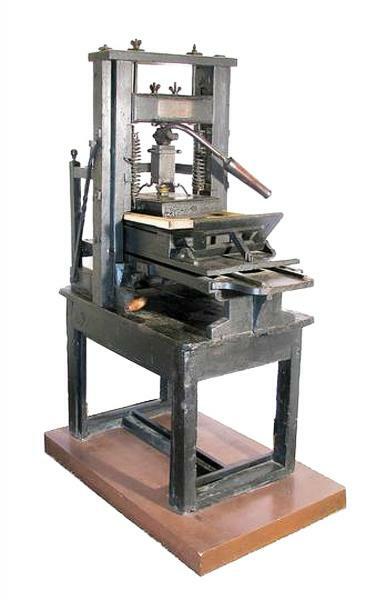 Some European press builders were making small size Common presses (Ben Franklin had one at Passy) which were essentially “tabletop” versions usually with a specially-built stand to raise them to working height. There is an apparently English-made one now in Mexico, and the Smithsonian has a miniature French Common press. A few years later Adam Ramage of Philadelphia was building them as “proof” presses. I would guess that van der Kemp had a press very similar to the one in Mexico, though that one was probably made in the early 19th Century. thanks, this helps a lot. i’ve found some information on the internet about how these presses worked, as well as a few glossaries for the terminology. Does anyone know of a site or book where someone describes the printing process in laymen’s terms, step by step (on a wooden 18c common press - as bob recommended). I’m writing a book about eighteenth century South Africa and I need one character to tell a farmer who have not seen a press before what he is doing while he is putting the press together and then printing a page or two. That would be portable and wouldn’t need all the type and things, but would only do a limited number of copies from each original. There is still the problem of how he might have sourced sufficient suitable paper, which was a major issue in other missionary situations. Where do you begin? The printer needed 4 seperate items to come together to create a final printed readable page. 1. Press 2. Paper 3. Ink and 4.Type or Form. If all were in place he would begin with typesetting by hand individual letters of lead type from a type case. Line by line and assemble them into a form that would be locked up onto the bed of the press. This bed slides out of the impression tower and a fly cage is open to expose the type. He would ink the type with two ink balls that are made of leather and kept in linseed oil to remain supple. Paper is then carefully placed over the form and the fly cage closed and the bed cranked under the press. He would then pull on the handle to transfer the inked image to the paper. The bed would be brought back from underneath the impression tower and the fly cage (frisket) openened and the printed page removed. The impression tower could not produce enough pressure for a full form so it was placed in the impression area twice for a second pull on the other half of the form. Please correct any terms I have stated in error. thank you so much for all the help, this site helped me more than the whole university library. Fly cage and Impression Tower? It’s called Tympans and Frisket, and Press Frame or Cheeks and Winter, Till and Head (part of the frame under the type bed and carriage and ribs is called the Summer). And inking balls were not kept in linseed oil, but had to be dry in order to take up ink. Anyone who wants a good description of the printer’s tools and how they were used might wish to locate a copy of the second volume of John Johnson’s Typographia or the Printer’s Instructor or the somewhat less descriptive Mechanick Excercises on the Whole Art of Printing by Joseph Moxon. The records of the London Missionary Society can be found at the library of the School of Oriental and African Studies in London. Examination might reveal more definitive information as to the contents of his printing office. Since van der Kemp produced the first printed work in book form in South Africa in 1799, one must assume he was set up with a common press and types. The reference to a small press may not be to the actual size of the press, but to the size of his printing office. Valentine Alexius Schoonberg a Bavarian retail merchant and/or a missionary based at the Cape of Good Hope in South Africa . He was suspected of being a co-conspirator with individual/s being held (around October 1800) at the Castle after sentencing for capital crimes. He printed the first known book (title plus 7 pages in paper covers) in the Cape, it is also the earliest known printed religious publication in South Africa. A translation, from English to Dutch, of a letter brought out by Dr. J. T. van der Kemp of the London Misionary Society in 1799 to their follower in the Cape entitled “Brief van het Zendelings Genootschap te London aan de Godsdienst-lievende ingezetenen van de Caap de Goede Hoop”. It is possible that he made use of Ritter’s press. Only one copy is known to exist and is in the South African Library. If the book’s character were actually a printer I suspect he would have used printers’ terminology to describe what he was doing, not make up names for the parts — if you’re going to describe something to someone unfamiliar with the terms, using the correct terms gets them acquainted with them and they initially are no more meaningless than made-up terms. The press would ordinarily have been assembled by a joiner, though if moved disassembled by the frontier printer he would have to do it himself. Paul’s nomenclature is correct, though perhaps it isn’t clear what parts go where. The paper would have been laid not on the inked type but on the tympan, then the frisket closed over it to hold it in place, then the tympan and frisket together folded down over the type. The wooden hand presses were “two-pull” because they did not have enough strength to print the entire area at once, so the bed was run in under the platen part way, the bar was pulled, then the bed was run in the rest of the way and the bar pulled again. Then the bed would be run out, the tympan and frisket opened up, the printed sheet removed and a fresh one laid on while the second man was inking the type for the next impression (hand presses were usually operated by two people, a “puller” and a “beater” (so-called because the ink was applied with ink balls dabbed onto the type)). 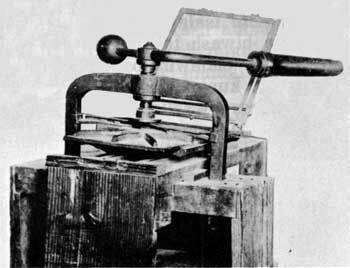 Note that the press pictured above has a one-pull size platen because it is a small press, so the process would not require two pulls as described unless a full-size Common press was being used. You could get in touch with the specialist on wooden presses in the Netherlands, Prof. Dr. Frans A. Janssen, in Krommenie, the Netherlands. It might be useful to take a read through some primary sources. First would be James Moxon’s “Mechanick Exercises”. It’s about a century earlier than your time period but the terminology and technology would have been almost exactly the same and the book was well-known even at the end of the 18th century. Another possible help would be Phillip Luckholme’s “The History and Art of Printing” from 1771. Also, John Smith’s “The Printer’s Grammar” from 1787. These would all have been possible resources for your character. Free, scanned copies of all three are available on Google Books. This article is about another missionary (in the 1830’s) who also made use of a “small hand press”. I’ve posted it here so that you can see the style of press that he was using and to show that there were many different designs for small, portable presses. It’s a neat little press in it’s most basic form. I would think that almost anyone could build a copy of the press shown in the article. Johnson’s Typographia Vol. 2 is available on Google Books, the earlier manuals (especially Luckombe) are almost word for word from Moxon. Johnson’s illustrations are better, and his descriptions of process are longer and written more clearly. Still, it doesn’t hurt to try and find a press in a museum or library and have a chat with a curator who knows how the presses were operated. There are some short videos on YouTube that show wooden printing presses being operated, and some, particularly the ones from Williamsburg, Virginia have good commentary while printing. The Oregon iron and wood hand press pictured above was built by Adam Ramage, probably around 1825-1830. It is as far as I know the only surviving example of this model, which he called a proof/copy/seal press. The Wikipedia article is a result of my researches and the errors are mine too. I have not come across any original literature indicating that Kemp had his own press. The earliest ‘porta presses’ that are commonly discussed are those that went to the Genadendal and Kuruman missions. It would be good to find any other original references that mention an additional press in the early days of SA printing. The references I have are listed on the http://en.wikipedia.org/wiki/Johann_Christian_Ritter page who was the first printer in SA.